There was the wonderfully fun South Pasadena Arts Crawl on July 14 where not only did I demo, I also got to unveil my new marbled boxes (which I'm still madly in love with). I built a semi-monster tank and marbled in EXTRA LARGE for the first time. I taught two fantastic "Experience the Tank" classes. There's still room in this Saturday's class, the last one I'm teaching for a while...come play in the tank while you can!! I had an invigorating design-technique breakthrough and embraced SPACE. 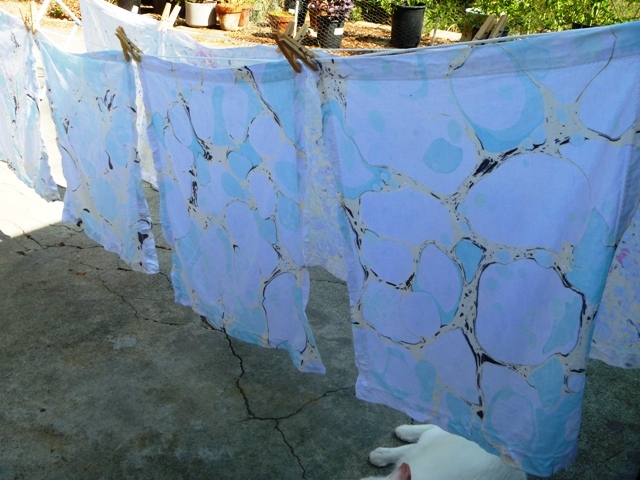 And now this: yesterday, I did my second rinse on a set of MARBLED CLOTH NAPKINS! Two of these napkins fit perfectly in my new semi-monster tank so after I was done marbling in Extra Large, I decided to use up the bath on these babies. They are 20"x20" (big ones! ), 100% cotton, and are hemstitch finished (so no sewing for me!). 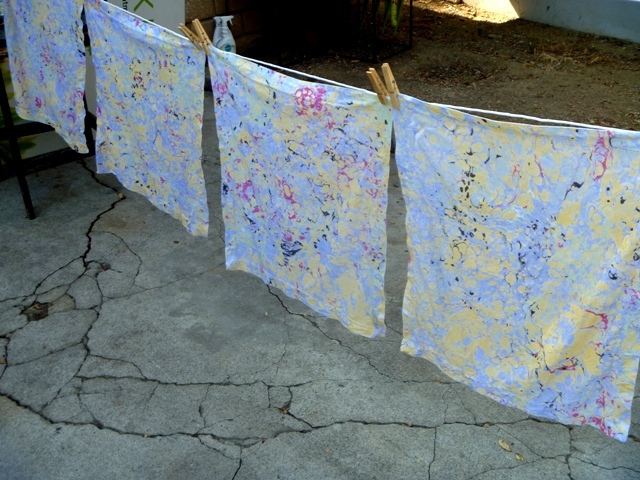 I bought them back in March for my fabric marbling class at Arrowmont but they didn't arrive in time...and they've been packed away in my studio until last week. 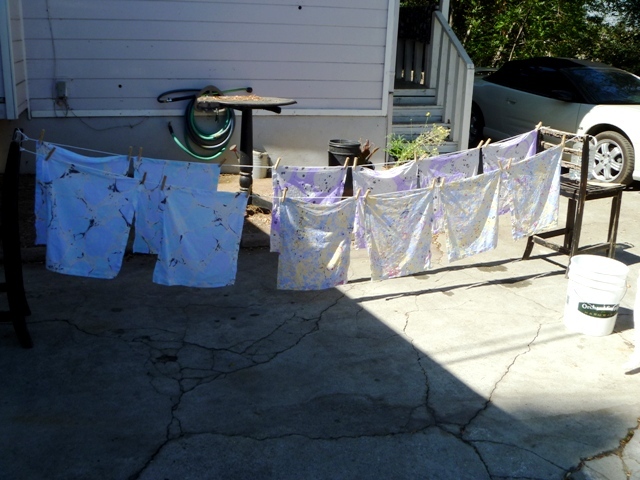 I marbled three sets of four napkins (in other words four napkins per design) and they are now curing for a week before their final wash, rinse, and iron. Then one set will be shipped off to mom, one set I'll keep for myself (to test washability and longevity), and the last set I'm sending to one of my aunts because she loves cloth napkins and I think she'll get a kick out of them. Then, if they seem to hold up well, I'll be marbling more and selling them! So, is anyone else out there feeling like SO MUCH MAGIC is happening this summer? I can't shake the feeling that the Universe is throwing things at me left and right and I'm so preoccupied with GOING FOR IT that I don't realize what I've gotten myself into until I'm all the way into it! I'm not complaining!! It's been so much fun. I'm just sort of in awe at what's been unfolding in the studio of late and was wondering what amazing things others are doing this summer.